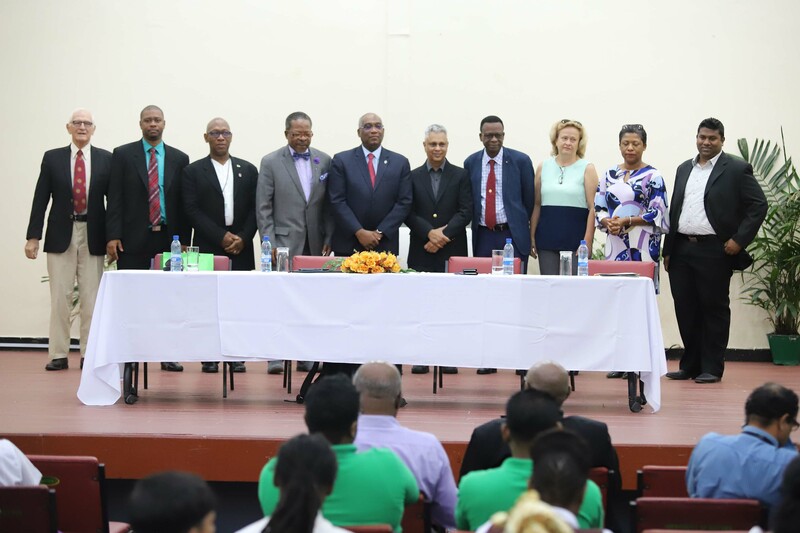 Under the theme ‘Engineering for First Oil and Beyond,‘ the University of Guyana (UG) yesterday launched undergraduate and post-graduate degree programmes in the area of petroleum engineering. The Associate of Science Degree in Petroleum Engineering will be offered by UG in collaboration with the University of Trinidad and Tobago, while the Master of Science in Petroleum Engineering will be offered by the University of the West Indies (UWI) in collaboration with UG. Speaking at the launch at the Turkeyen Campus yesterday, UG Vice-Chancellor Professor Ivelaw Griffith noted that the programmes, which are part of the Department of Petroleum and Geological Engineering, were enabled by partnerships developed over a period of 15 months. He said these partnerships will help UG to deal with some realities that it cannot handle alone even as he emphasised that the pursuit of more partnerships is part of the intent as the university seeks ways to meet the needs of the nation and to take advantage of opportunities that go beyond oil and gas. 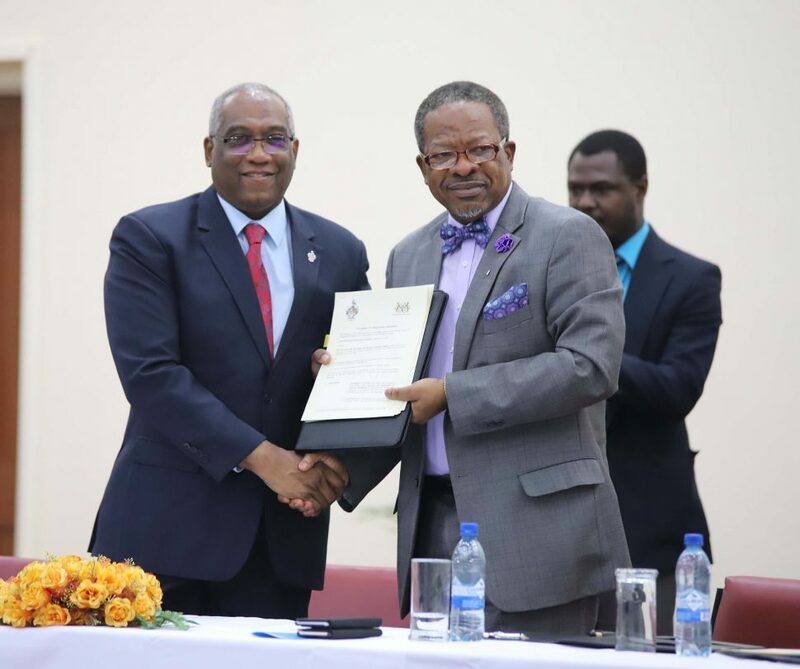 Professor Brian Copeland, Pro-Vice Chancellor and Principal at UWI’s St Augustine campus in Trinidad, stressed that the realisation of the programmes is a perfect example of how focused commitment and co-operation can have positive outcomes. He said the programmes are perhaps the first critical steps which would equip and encourage citizens to take responsibility and use their knowledge to ensure there is accountability in the extraction process, and to ensure that Guyana gets its fair share of monetisation of the natural resource. “Even better, it sets the stage for Guyana to take better command of its oil and gas sectors in the not-too-distant future,” Copeland added. He reminded that Guyana is lucky to have contrasting examples, in the realities of Venezuela and Trinidad, of how an oil and gas sector can impact an economy. “In Trinidad and Tobago, as much as we have done many things right, there have been too many missteps, especially in the area of education,” he explained, before adding that lessons, which come only with lived experiences, are quite different from those learned in a classroom. Copeland stressed that no matter what happens in the oil and gas sector, Guyana needs to remember to focus on a wide spread of businesses and foreign exchange earners since the danger of relying on just a few mainstays should be obvious. “It’s like having a table standing up on one leg,” he said, adding that Trinidad has seen that while the economy relies heavily on oil and gas, the sector does not employ all that many people. A symposium, which began at 9 am, continued until just after 2 pm with several plenary sessions to help students understand the petroleum systems applicable to Guyana, the technical needs of Guyana’s oil and gas sector, environmental issues related to the sector, as well as the type of graduates needed for a petroleum downstream industry in Guyana.